Laurel LAC-17 Series — C&A Associates, Inc.
Like our other LAUREL products, LAC-17 Series has gone through our own Quality Examination in order to keep the Quality at high. We now confidently introduce that LAC-17 Series with JAPAN Quality such as the reliability, the durability, and the accuracy at the highest level to fulfill your demand. The operation of LAC-17 Series is incredibly easy. It will not take much time to teach how to operate. The operator can control the machine intuitively by using only 6 Function Keys and Jog Dial while seeing Large Color LCD Display. LAC-17 has the incredibly high Productivity. The LAC-17 Series boast a wrapping speed of max. 40 rolls /min. and will significantly improve the operation efficiency in your daily coin-handling work. The LAC-17 Series high productivity and the functionality of LAC-17 will meet your requests and solve your problems. 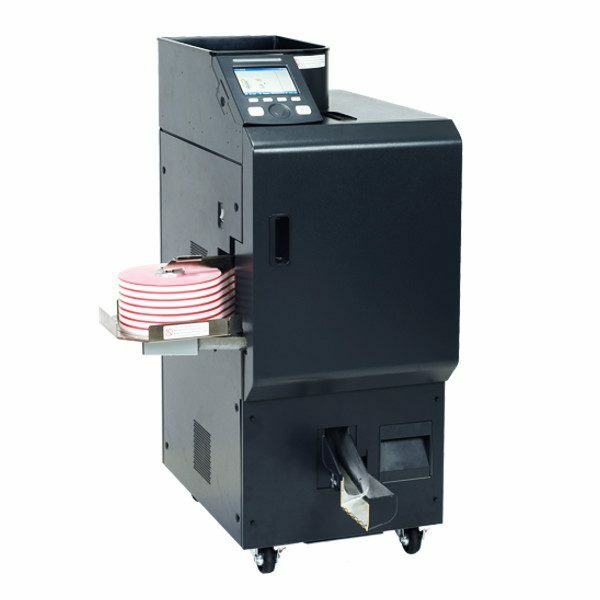 LAC-17 Series has been designed as the User-friendly machine. This design concept of the machine will increase the productivity and minimize the burden of the operator. Since the Large Color LCD Display has been placed at front, the operator can comfortably keep the face position at straight to the Large Color LCD Display.